I join previous speakers, Mr. President, in congratulating you on your election as the President of the 65th Session of the United Nations General Assembly. I am confident that under your able stewardship our deliberations will be fruitful. Sixty-five years ago, the creation of the United Nations heralded hope for global peace, security, and respect for human dignity. And today the UN remains the most effective universal body in preserving the principles upon which it was founded. 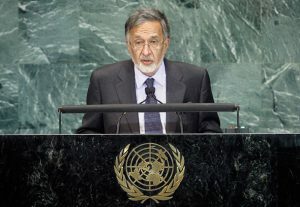 As one of its earliest member-states, Afghanistan fully and consistently subscribes to the centrality of the United Nations, and to the principles of multilateralism that guarantee a democratic international order, in which we all have an equal voice and participation in decisions impacting our world. Today, more than ever before, our world demands a commitment to working together so that we may overcome the multifaceted challenges and threats to our survival and well-being. The United Nations is pivotal to our ability to translate our common sense of purpose and determined political will to replace desperation with hope, poverty with prosperity, injustice with justice and violence with peace. Last week, the High-Level Plenary on the MDGâ€™s adopted the Outcome Document and Action Plan for the full realization of the Millennium Development Goals (MDGs). Fifteen yearâ€™s ago when the MDGs were adopted, we recognized that comprehensive and collective effort was essential for the attainment of the goals. Last weekâ€™s Summit again underscored the need for enhanced international cooperation and coordination in order to achieve human development and well-being. Afghanistan remains fully committed to meeting its MDG targets. We have made some progress, but the scourge of international terrorism, insecurity, and threats to the rule of law and governance remain enormous challenges to promoting human development in Afghanistan. 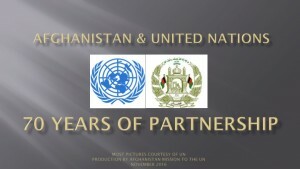 On the of the eve of the 9th anniversary of the declaration of the Global War on Terror in October 2001, the international communityâ€™s promise to the people of Afghanistan of a life free from the fear of the threat and exploitation of international terrorism remains unfulfilled. Afghans continue to suffer from horrific acts of terrorist violence on a daily basis. On many occasions from this podium, the Afghan delegation has drawn the attention of the global community to the reality that terrorism and the ideologies of extremism and radicalism are spawned beyond the borders of Afghanistan. In spite of the combined efforts of our military allies, terrorists continue to infiltrate our borders with the intent to inflict harm on our people and soldiers of partner countries.Â As long as certain state and non-state actors provide Al Qaeda, and its affiliated individuals and entities with sanctuary, arms and financing, they will remain formidable and murderous adversaries. Terrorism in our region is a growing threat to world peace and security. The audacity and geographic scope of extremist and terrorist groups harbored in our region continues to expand.Â If our international partners and allies wish to win the global war on terrorism, they must look beyond villages in Afghanistan, and engage in a strategy that will effectively and decisively dismantle organizations and networks that continue – with immunity- to support terrorist and radical militants.Â Terrorism remains a global challenge which can be defeated only through a concerted international effort. In this context, Mr. President, Afghanistan is committed to expanding counter-terrorism cooperation with the Government of Pakistan and with other countries in our region. The people of Afghanistan have known too much violence and too much despair.Â We have seen too many of our youth lose their lives as a result of war and conflict. The Afghan people crave peace, stability, and security. Though our fight against those who menace the life and well-being of our people will continue unabated, we recognize that the success of our efforts for development and prosperity depends largely on our ability to achieve sustainable peace in our country. With this objective in mind, the Afghan Government convened a â€œConsultative Peace Jirgaâ€ in May of this year.Â The Jirga fulfilled President Karzaiâ€™s promise to consult and engage all Afghans in peace-building initiatives. The Jirga, which assembled tribal leaders, representatives of provincial councils, parliamentarians, businesses, civil society, and had over 20% female participation, helped to jump-start a representative peace and reconciliation process that will be pursued in conformity with our Constitution and human rights commitments. The Consultative Peace Jirga agreed on a framework to encourage the rank and file of the Taliban to end violence and to join a reconciliation and reintegration process.Â It defined the conditions for a peace dialogue with Taliban leaders, and endorsed the establishment of a Peace Commission to oversee the reintegration of armed opposition fighters, who renounce violence, resume civilian life, accept our constitution, and embrace our democracy. Over the past eight years, we and our international partners have realized substantial achievements, but also have made mistakes.Â Many challenges and obstacles remain in ensuring sustainable security for the people of Afghanistan, and to meet their aspirations for a better life and future. 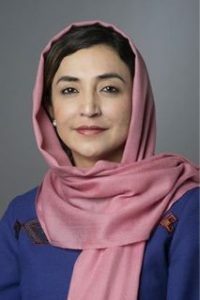 At the London and Kabul Conferences, held earlier this year, the international community not only reaffirmed its commitment to safeguard Afghanistanâ€™s sovereignty, territorial integrity, and stability, but also recognized the critical importance of Afghan ownership and leadership to consolidate our joint achievements, and to engage the greater confidence of the Afghan people. By building on the mutual commitments made at the milestone conferences of London and Kabul to transition security and development responsibilities to the Afghans, and by pursing comprehensive economic development, security, governance, and our inclusive reconciliation strategies, we are convinced that we will successfully combat the efforts of extremists and terrorists to regain hold of Afghanistan. For our part, the Government of Afghanistan is steadfast in its commitment to pursuing the reform agenda that President Karzai outlined in his inaugural speech.Â We are committed to reinforcing our social compact with the people of Afghanistan by strengthening our judiciary, combating corruption, revitalizing our economy, and promoting good governance at all levels of government. As demonstrated by the recently held parliamentary elections, the government and people of Afghanistan are steadfast in advancing our democracy. With the support and collaboration of our international partners and allies, we are committed to enhancing the capacity and ability of the Afghan Security Forces to assume greater responsibility for the protection and security of our country. In this context, I wish to acknowledge the enhanced effort of our military allies to protect our civilian populations from the detrimental effects of military operations against the terrorists and militants. The people of Afghanistan embrace the challenge of building a better future. However, insidious dangers of extremism and terrorism and their ever-increasing link with narcotics pose a serious threat to the security and stability of our country and region.Â Along side our fight against terrorism we are committed to working closely with our neighbors and other international partners to win the war on narcotics. To complement our efforts towards eliminating poppy production, we wish to see greater action to counter smuggling of precursors into our country and to reduce demand and consumption of drugs in other countries. Recent climate-induced disasters experienced in our region, such as the catastrophic floods in Pakistan pose severe challenges not only for local populations and national governments, but may carry ramifications on the economies of regional countries, and global security. We see increased urgency for effective regional collaboration for disaster mitigation and response. At different international, regional and sub-regional gatherings, we have emphasized the importance of a stable, moderate, and democratic Afghanistan for economic development of our region and global security. By the virtue of its location at the heart of four important geo-strategic regions (Central Asia, South Asia, China and the Middle-East), Afghanistan could play an important role in facilitating increased trade and transit in the region, and unleashing the enormous potential in our region. We will work to further gains in increased trade and transit with regional countries. The recent conclusion of the Afghanistan-Pakistan-Trade and Transit Agreement (APPTA), and signing of the Heads of Agreement for the Turkmenistan-Afghanistan-Pakistan-India (TAPI) gas pipeline project are milestones for increased regional cooperation. Additionally, we have concluded the feasibility study for the CASA 1000 project for transfer of electricity from Kyrgyzstan and Tajikistan to Afghanistan and Pakistan.Â These initiatives will contribute greatly to peace, security and stability in our region. Afghanistan stands ready to intensify cooperation with all its neighbors on the economic, political and criminal issues. I have spoken of the desire and right of the people of Afghanistan for peace and stability. We are, however, acutely aware that for over half a century our brothers and sisters in Palestine have been denied their right to an independent state, living in peaceful co-existence with its neighbors. We are encouraged by the resumption of direct talks between the Israeli and Palestinian leaderships, which hold the hope for securing sustainable peace in the Middle East. To conclude, I thank the member states of this august assembly for their solidarity and support for the liberty and well-being of the people of Afghanistan. The Afghan people will never forget the generosity and great sacrifice of the United States, NATO partners, and other international partners, whose men and women have bravely stood with us to defend our common security, and ensure peace and stability for Afghanistan. I thank His Excellency, Secretary General Ban Ki-Moon for his efforts to revitalize the sense of partnership, cooperation and confidence between Afghanistan and the international community. I also thank the dedicated and committed staff of the United Nations and its specialized agencies for helping the Afghan people to build a peaceful, secure and prosperous future.